In spite of a lineup featuring Suzuki, Smoak, Death To Flying Things and scrubs, the Seattle Mariners sit just one game under .500 at 24-25 and trail the first-place Rangers by a game-and-a-half. The offense is still wheezing along, besting only the Twins in park-and-league-adjusted batting, and the M’s have been the worst defensive club in the AL thus far, according to Ultimate Zone Rating. The starting pitching, on the other hand, has been superb and has kept the Mariners in AL West contention to this point. With a collective 3.40 xFIP from its starters, Seattle is neck-and-neck with Oakland for the top honors in the league. Felix Hernandez, as always, is dominating. Jason Vargas and Doug Fister are pitching fairly well, and Zombie Bedard has been fantastic this May. King Felix isn’t the only royalty in Seattle’s rotation, though — Prince Michael Pineda is making major league hitters look like mere paupers during his rookie season. A 22-year-old righty who stands 6-foot-7 and weighs in around 260 pounds, Pineda got plenty of prospect love before the season. Baseball America, Baseball Prospectus’ Kevin Goldstein, ESPN’s Keith Law and our own Marc Hulet all ranked Pineda as a top-25 farm talent prior to 2011. And Dan Szymborski’s ZiPS projection system thought he’d hold his own in the majors this year, forecasting a league-average ERA with around 7 K/9 and a walk rate slightly over three per nine frames. Instead, Pineda has pitched like an ace from day one. The San Cristobal, D.R., native leads all qualified AL starters with 9.41 K/9, and his walk rate (2.16 per nine innings) ranks in the top 15 among Junior Circuit starters. His 2.98 xFIP is 24 percent better than the league average and is bested by only James Shields and King Felix in the AL. With a 71.2 first-pitch strike percentage, Pineda is getting ahead in the count 0-and-1 or getting batters to put the ball in play on the first pitch more frequently than any other big league starter. He’s also luring hitters to chase pitches out of the zone at the highest rate among starters, at 39.2 percent. 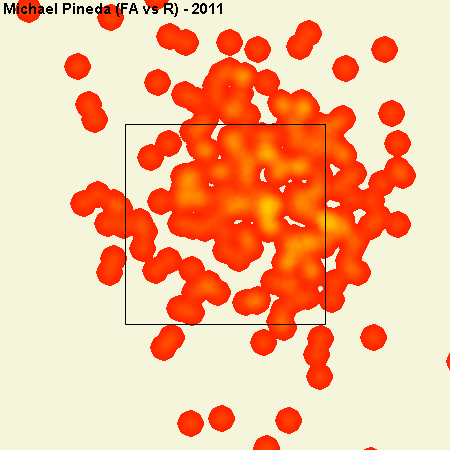 Pineda is punishing batters mainly with two pitches: a blistering fastball averaging nearly 96 MPH and a mid-80s slider. That heater, which has topped out at near-triple digits, is getting whiffs between 10 and 11 percent of the time that he throws it (six percent major league average). 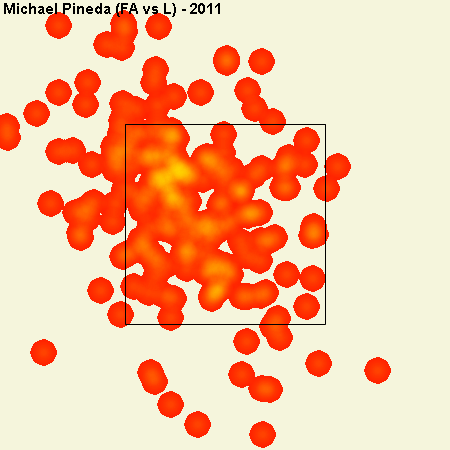 Pineda’s hard breaking ball has a whiff rate slightly over 20 percent (13-14 percent MLB average). There were concerns entering the season that Pineda would struggle against left-handers, given his lack of a reliable changeup and that sliders tend to show a large platoon split (opposite-handed batters handle the pitch much better). Happily, lefties haven’t posed a huge problem for Pineda through his first nine starts: he’s got a 3.53 xFIP versus hitters batting from the opposite side, and a 2.51 xFIP against righties. With the slider, he’s mostly keeping the pitch in the zone against lefties, while either spotting the pitch low-and-away to righties or putting it off the plate to induce many of those aforementioned outside swings. Pineda has already racked up 1.9 Wins Above Replacement this season. While we shouldn’t expect him to continue to be this good, Pineda is well on his way to one of the better rookie campaigns in the past three decades. Since 1980, only 15 starting pitchers have posted at least 4 WAR during their rookie year. The last person to accomplish the feat was Brandon Webb, in 2003. In the unlikely event that the Mariners remain in contention (Baseball Prospectus’ Playoff Odds give Seattle a two percent chance of playing postseason ball), the M’s would have to consider how hard they’re willing to work a franchise cornerstone who missed much of the 2009 season with an elbow injury and whose career high innings total in the minors is 139.1. For now, though, we can all sit back and enjoy Prince Pineda’s dominance. We hoped you liked reading Prince Pineda Is Dealing by David Golebiewski! I think there’s a certain USS Mariner C/O that’s happily eating some words after Pineda’s first 60 innings pitched. for sale high quality n i k e shoes and other sporting goods.